After my Catching Fire manicure, I wanted to try a layering using polishes from both of the Hunger Games collections. I knew I wanted to use 1 of the 3 Glosstinis that didn't make it into the Catching Fire Gradient, so that left me with Pyro Pink, Scalding Emerald, and Violet Flicker. I only own 3 of the 12 China Glaze Hunger Games polishes... Agro, Fast Track, and Riveting. Out of those choices, it seemed natural to pair Agro from China Glaze with Scalding Emerald from CoverGirl. 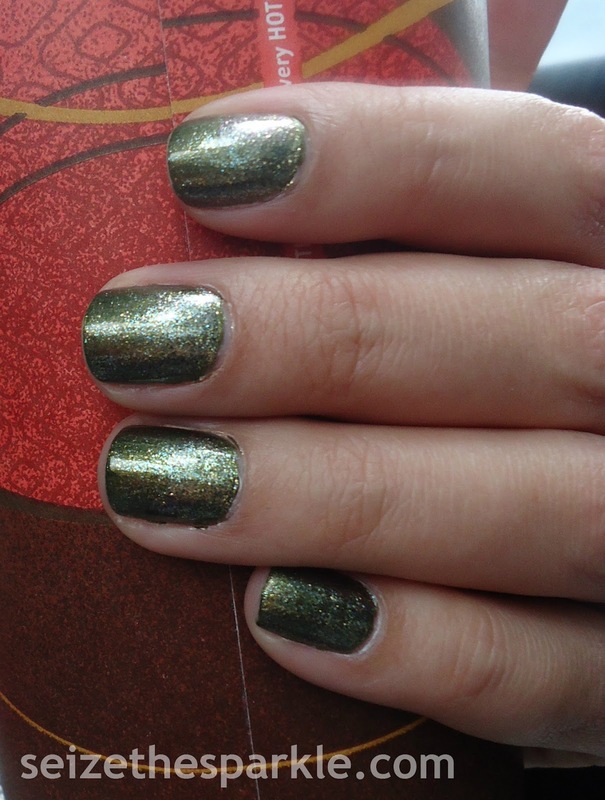 China Glaze Agro is a really pretty metallic olive green polish. If you look closely enough at it, you'll see very fine shimmery particles, not all that different from those found in Scalding Emerald. I used Scalding Emerald and Champagne Siren to create a gradient effect at my cuticles. But it didn't really show up. You can kind of see it, but for the most part, it just looks like I painted Scalding Emerald on right over top. I haven't ever worn Agro before, and if I had, I probably would've timed my layers a little better. I'm guessing it's because of the metallic semi-foil finish, but it dried really fast. When I painted on the second coat, it was a little gloppy. After a decent night of thrashing in my sleep, I managed to completely wreck my thumbnails. Do I like this layering? Meh. It's not that I don't, but it's not that I do, either. I think it could use something else to liven it up, but I'm not really sure what. I thought Champagne Siren would do that, and it just did nawt. Oh well!